Put the spinach in a large bowl. Peel and finely chop garlic and add the bowl with the spinach. Season with salt and pepper and drizzle with olive oil. Toss to coat and set aside. Slice mozzarella and tear prosciutto into pieces. In another bowl, beat the eggs and season with pepper. 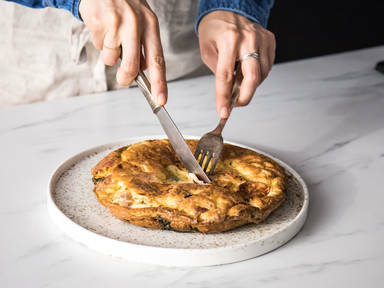 Place a large plate over the pan and invert the frittata onto it. Carefully slide the frittata back into the pan so that the mozzarella and prosciutto are facing downwards. Cook for approx. 2 min. or until the surface is golden brown and set. Place a serving plate over the pan to invert the frittata once more. Slice into wedges and enjoy!